What took place in November 2011 was neither a debate nor a discord. The venue was Thiruvananthapuram, at the Joint Annual Conference of Indian Archaeological Society (ACIAS), Indian Society for Prehistoric and Quaternary Studies (ISPQS), and Indian History and Culture Society (IHCS). Strongly criticising the archaeological excavations at Pattanam site in Kerala and the rambling hotchpotch of cultural remains without periodisation especially pottery, veteran Archaeologist and former Director of Archaeology and Museums, Karnataka, A Sundara’s strong criticism came after the Kerala Council for Historical Research (henceforth KCHR) Director presented his paper on Pattanam excavations. Professor Sundara is one of the most reputed Archaeologists in India known for his objective outlooks and unbiased conclusions for which he was honoured at the meet. Earlier, Professor Sundara was also one of the well wishers of Pattanam excavations in the Pattanam Archaeological Research (PAR) brochure published by the KCHR in March-April 2008. His censuring of Pattanam excavations although came as a surprise, was not an isolated incident. Much more censorious on Pattanam was Professor MGS Narayanan, eminent historian and former Director of ICHR. In an earlier seminar held at Kochi in August 2011, Dr R Nagaswamy, former Director of Archaeology, Tamil Nadu criticised the KCHR for its biased approach and hasty conclusions to establish some hidden agenda at Pattanam. Dr T Satyamurthy, former Director, Archaeological Survey of India (ASI) was equally critical of the excavations and cautioned KCHR authorities against any hasty conclusions. Pattanam excavations form part of the Muziris Heritage Project (MHP) launched by the KCHR and headed by Chairman Dr KN Panikkar, former Professor of Jawaharlal Nehru University (JNU), and Director Dr PJ Cherian, a modern historian who heads archaeological excavations. In a write up for Malayalam journal Mathrubhumi in 2014, Professor PM Rajan Gurukkal, historian and one of the members of the MHP arguing for Pattanam also admitted that the site was unfit for any archaeological excavation as the soil has been virtually tampered for various construction purposes and digging of wells leaving no space for stratigraphical analysis of the cultural remains which have agglomerated. Surprisingly until now, no historian or archaeologist or any professional body such as the ASI has come forward in defence of the KCHR or Pattanam. Even Professor Romila Thapar, one of the patrons of the MHP is virtually silent. The site of Pattanam is located near Parur in Ernakulam District of Kerala. It was declared by the KCHR mhp that the aim of the mhp was to excavate and discover the lost settlement of Muziris, the ancient Chera capital on the Periyar River basin and hence named MHP. The geomorphology of Kodungallur, considered ancient Muziris, was examined by Geologists KK Nair and CS Subrahmanyam in 1993 in the archaeological context, which revealed that the area has been completely disturbed and the habitation material deeply buried due to tectonic changes. The Malabar Coast has both submergent and emergent characteristics. The Periyar River which drains the region has a long history of frequent floods due to heavy monsoons. In the beginning, the excavations at Pattanam sailed smoothly. But controversies started after the excavators claimed that an ancient township at the cusp of first century BC and first century AD was unearthed at Pattanam archaeological site. Claims on the discovery of urban architectural remains at Pattanam were made by the excavator in various published papers and reports such as The Living Dead and the Lost Knowledge – 2007 and 2008 published by Department of Culture, Government of Kerala, Journal of Indian Ocean Archaeology 2009-2010 and in the paper presented at ACIAS on November, 2011 at Thiruvanantha-puram. It was declared by the KCHR Director who is also the excavator that, Pattanam revealed interesting “early historic urban architectural features”. The excavator claimed that the “urban, multi cultural and maritime features are principal attributes” of Pattanam site. It was further asserted by the KCHR that the brick house comparable to a warehouse exposed near the wharf in trench PTO7 III included a platform (006) with postholes (67 in number) and brick walls belonging to at least three different phases. It was stated that the postholes do not show any particular pattern and were dug at various periods indicating repeated use for a long duration. In the Journal of Indian Ocean Archaeology 2009-2010, the excavator claimed the presence of ancient civilisations at Pattanam. He also claimed Pattanam as an advanced metal working and stone cutting site with metal objects and lapidaries. Recently, the botanical remains claimed to have been unearthed from Pattanam were handed over to Spices Board in Kerala, a marketing and research institute for spices for palaeobotanical studies. Carbon 14 dating of remains from Pattanam are conducted by Georgia University. The ASI has been kept away and excavations are coordinated by foreign universities. Later, the Director of KCHR Dr PJ Cherian admitted in The Hindu dated June 12 in 2011, Thiruvananthapuram edition that, “curiously, while large collections of artifacts were found, no remnants of major structures were discovered at the site”. In the KCHR Annual Report 2009-2010 there is neither reference to such urban architectural remains or photographs of trenches. Those who visited the site were unable to see any urban architectural remains. In the KCHR brochure published in February 2008 on MHP and Pattanam excavations, Chairman of KCHR, Professor KN Panikkar stated in his editorial note that archaeological and historical research are not solely meant for experts and professionals in the field. Everyone with thinking power should handle it. Later elaborating further, in an interview given to Frontline dated April 2010, Panikkar made his stand much clearer. He suggested public participation in archaeological excavations at Pattanam–which he termed “Democratic Archaeology”–in which the local people would be part of the excavation. In other words archaeologists and ASI need not interfere in excavations since guidelines and diggings shall be by ‘People’s Democracy’. Keeping Archaeologists at bay was a necessity for KCHR since expertise observations and remarks can lead to serious implications for Pattanam. Beyond all such serious lapses and incredible turnovers at Pattanam, what has raised eyebrows is the interference of JNU historians who were hastily propagating for Pattanam excavations to obtain it credibility in the academic world. Professor Kumkum Roy of JNU, in her Historical Dictionary of Ancient India published in 2009 has highlighted Pattanam stating that it has now been identified with ancient Muziris. Similarly Professor Ranabir Chakravarti of the JNU in his work, Exploring Early India published in 2010, brings Pattanam into focus. Roman amphorae from Pattanam are exhibited as evidence of Mediterr-anean trade. It is not a new discovery. There are a number of other sites in India which have provided remains of Roman amphorae. But here the intention raised suspicions due to later events. What has now snowballed into a major controversy is the open declaration by KCHR Director, Dr Cherian in the official bulletin of the Assyrian Church of the East on March 2011, that Pattanam has been identified as ancient Muziris, where Apostle Thomas landed in India 2000 years back for propogating Christianity, which he claims has been vindicated by the excavations. In 2011 July, he presented a paper on Pattanam archaeology at a seminar organised by Syro-Malabar Church in Mumbai. A major paper on St Thomas tradition in southwest coastal region in India was presented by Dr Pius Malekkandathil, who is a Reader at JNU. Earlier at Kakkanad near Kochi in 2005, Dr Pius Malekandathil presented his paper organised by the Liturgical Research Centre of the Syro-Malabar Church on the tradition of Apostle Thomas. Romila Thapar has put forward the arrival of Apostle Thomas as an outcome of Mediterranean trade links of India in her work—The Penguin History of Early India—published in 2002. In 2006, Professor Kumkum Roy was advisor to NCERT Textbook Devolopment Committee along with chief advisor, Professor Neeladri Bhattacharya both from JNU. In the history textbook on Social Science for Class VI, they have included Muziris in the map of important trade routes without mentioning Pattanam and linking it with arrival of first Christian preachers in India. Ranabir Chakravarti of JNU is one of the members of the NCERT Textbook Devolopment Committee. Assertive claims by KCHR authorities in establishing historicity of Apostle Thomas has been supported by the stand of Utio Rai Chaudhary and Furley Richmond, Academic Directors of Georgia University in 2011 December. 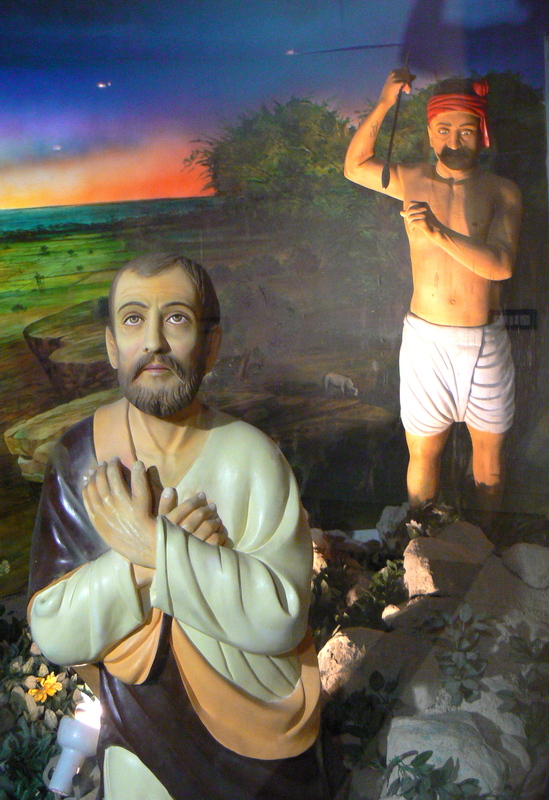 They stated that researches are being conducted by the Georgia University on links between St Thomas tradition and Pattanam. Interestingly this university has undertaken Carbon 14 dating of the Pattanam site. Historian Istvan Perczel from Central European University, Hungary was invited in February 2008, for delivering a lecture by KCHR Chairman Professor KN Panikkar former JNU luminary and the KCHR Director on the topic—History of Kerala Christianity. The February 2004 issue of Economic and Political Weekly has published an article on KCHR Family Archives Project by K George Verghese. He has alleged that the KCHR Family Archives Project is virtually filled with histories of Syrian Christian families all highlighting arrival of Apostle Thomas at Muziris. The family history archives project was implemented prior to Pattanam excavations to provide a link. This entry was posted in archaeology, muziris, pattanam, st. thomas and tagged archaeology, falsification of history, indian history, kerala council for historical research, muziris, p.j. cherian, pattanam, saint thomas. Bookmark the permalink. Thiruvananthapuram: Rampant irregularities pointing to corruption were detected at the Kerala Council for Historical Research (KCHR) headquartered here. It has emerged that the Director himself was involved in creation of fake government documents, illegal appointments and financial irregularities worth crores. It is alleged that Director had obtained the licence for Pattanam excavation after submitting fake documents at the Archaeological Survey of India. Since its establishment in 2001, General Council has not been convened even once. The General Council should include four MLAs, three Municipal Chairmen, six Panchayat Presidents, one district panchayat president and six social scientists. The Executive Council exists for namesake and it is not being convened as per the rules. The AG report has clearly pointed at the financial irregularities detected in the institution since 2007. The Director has made six foreign visits without the government’s sanction. Apart from this, building and land were brought without permission. The report also says that government money was deposited with different banks violating financial code and treasury code. In addition to this, the institution which was functioning under the Cultural Department was later made under the Higher Education Department, allowing the Director to avail UGC pay scale while increasing the age threshold for his retirement. In a grave violation of rules, Cheriyan still continue to hold the post despite passing 60 years of age. This is happening in the absence of any government order.